Last week we talked about the magical flavor that black garlic brings to a dish. If you missed our discussion on the topic, you can read the article here. Black garlic noodles are as delicious as it is versatile. Essentially you can make this dish to suit any diet whether it be omnivore, gluten-free or vegan so make adjustments as you need to. Since it is Monday Monday, I have created a vegetarian version for your eating pleasure. 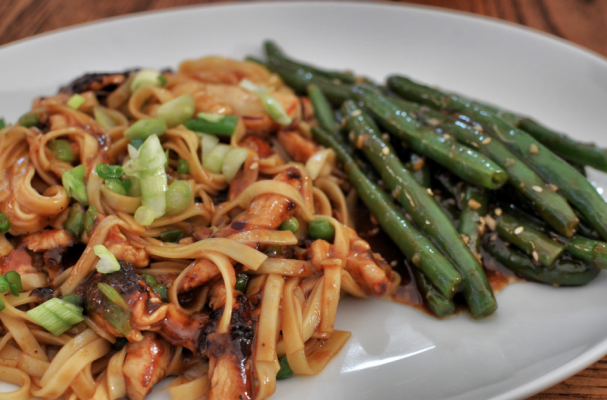 Egg noodles are tossed in a sticky sweet garlic sauce that is studded with mushrooms and snow peas. This recipe is so easy to put together, it is guaranteed to become a staple. Step 1: Fill a large pot with water and put over high heat. Once boiling, add the noodles and cook according to package directions. Step 2: Meanwhile, heat the vegetable oil over medium-high heat in a large saute pan or wok. Add the green onions and black garlic and saute them in the oil until fragrant. Add the mushrooms and snow peas and continue cooking, stirring occasionally. After the vegetables have begun to soften, about 5 minutes, and then add the palm sugar, mushroom stir-fry sauce and soy sauce. Stir the the ingredients together until the sugar has dissolved. Step 3: Add the noodles to the pan and toss until they are evenly coated in the sauce. Garnish with fresh green onions and serve hot. *Note: Feel free to add a variety of vegetables, scrambled egg or tofu to the mix. This is a wonderful recipe to use up any remaining ingredients hanging out in the fridge.